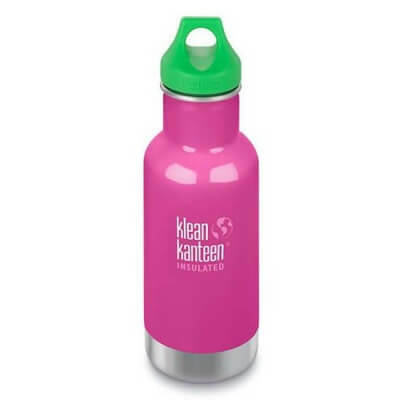 Vacuum insulated 12oz (355ml) water bottle for children and adults. Keeps drinks HOT for 12 hours and ICED for 40 hours. Lightweight, easy to hold and environmentally friendly. The Classic Klean Kanteen insulated water bottles are eco-friendly, toxin-free, safe, and easy to clean. They are also very good at keeping drinks either hot or ice cold thanks to the double wall vacuum insulation. The Kid Kanteen version is 355ml (12oz) and will keep drinks hot for 12 hours and iced for 40 hours. Making this the perfect bottle for children that love ice cold milk or toasty hot chocolate. This makes a great first bottle as it's lightweight and holds just the right amount to keep them hydrated without being too heavy to hold. For cold drinks, the bottle is compatible with the sippy cap (suitable from 6 months) and the sports cap (suitable from age 3) so there's no need to have a non-insulated bottle as well if you don't want to. The wide 44mm opening makes this bottle easy to clean, easy to refill and perfect for adding ice cubes or fruit to drinks. Electropolished interior - No Coating, No Paint, No nasties. Made from food-grade stainless steel. Won't retain or impart flavours. The perfect bottle for kids or adults. Small, lightweight, insulated. A great gift.